Sun starfish are invertebrates -- not true fish. The sunflower starfish (Pycnopodia helianthoides), sometimes called the sun starfish, reaches a record-breaking size. It is more than twice the size of the second-largest sea star, the crown of thorns. 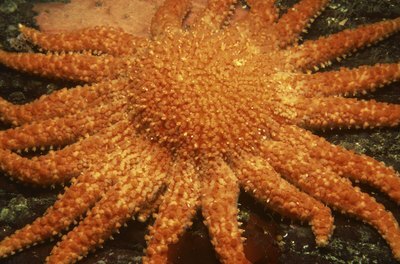 The sunflower starfish uses its large size to hunt smaller starfish across its native range and decimate other invertebrates with impunity. The sunflower starfish sets several records for size. It is considered the world's largest starfish. Each arm measures 16 inches from disk to tip, and the entire body measures 39 inches across. Additionally, it's the world's heaviest starfish, growing to an average adult size of 11 pounds. To put this in perspective, these critters reach about the size of a manhole cover, and weigh about as much as an average house cat. Sunflower starfish live along the coast of North America, from the Aleutian Islands to San Diego. They generally live in the same kind of habitat throughout their range. They typically live on various substrates like mud, sand and gravel, as well as boulders and rocks. Sunflower starfish stick to the intertidal zone, though they can be found to depths of 1,427 feet below the surface. However, it's rare to find them more than 400 feet below the surface. Sunflower starfish reproduce through broadcast spawning, a process where adults release sperm and eggs into the water. The gametes fuse in the water to produce swimming larvae. The larvae float around in the water for about 10 weeks, then settle on the ocean floor and metamorphosis into their adult form. However, the young sea stars only have five arms. As they grow, they grow multiple arms in pairs until they reach more than 20. It is not known how long it takes them to go from an egg to their record-breaking adult size. Sunflower starfish are slow-moving predators. They hunt other slow-moving invertebrates, cruising at speeds up to one yard per minute, roughly one body length. Their diet includes crabs, sea cucumbers, chitons and urchins. They will also eat dead and dying squid and fish. However, they most often eat other sea stars, particularly brittle stars. The sunflower sea star catches prey with its tube feet and pulls it towards the mouth on the underside of the central disk. Their large size dwarfs the other starfish they eat, making it easy to catch smaller echinoderms. How Many Kittens Does a Ragdoll Cat Usually Have in a Litter? What Is the Small Collie Dog Breed? How Big Does an African Butterfly Cichlid Get?